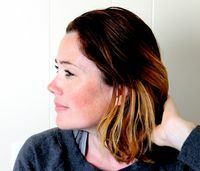 This week guest author Emma Jeffery from the blog Hello Beautiful shows us how she turned her grandmother’s handwritten recipes into tea towels for her own kitchen. Read the how-to below, or, jump to our up-to-date video tutorial from Spoonflower member Theresa at the bottom of the post. She’ll take you through each step from Emma’s tea towel concept, so you’ll learn how to edit your scanned recipe in Photoshop, all the way through to how to sew up the tea towel with a finished double-hem. Emma: For a woman who keeps a newspaper from the day she was born, my mum has surprisingly few keepsakes or handwritten memorabilia from her own mother who passed away in 1999. When I asked her to trawl through her old papers and files, she managed to find three handwritten recipes from my grandmother. They appear to be the only remaining examples of her handwriting left in the world, and they are therefore as precious as they are priceless. I decided to use these recipes to make a set of dish towels for my mum and I. This way, the handwritten originals can be safely stored away yet the joy of being able to see my grandmother’s handwriting in an everyday context will continue to make us smile and feel close to her. 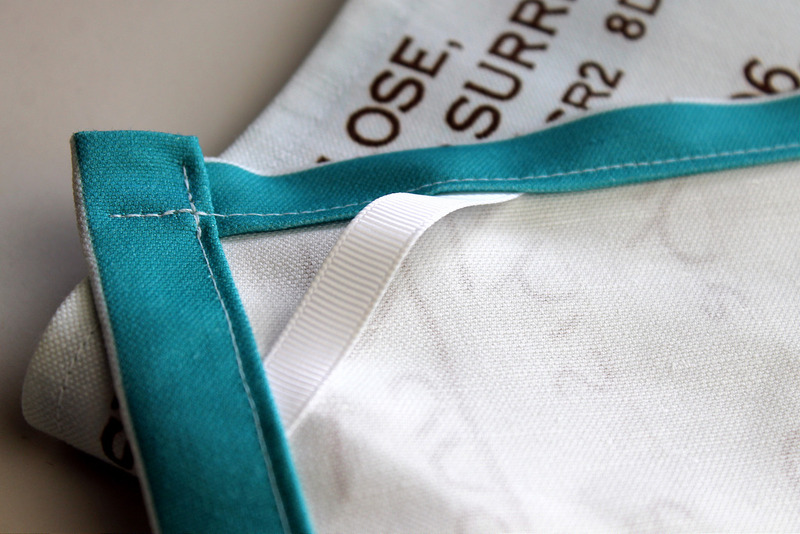 Spoonflower’s linen cotton canvas is the perfect fabric for dish towels. Linen is known for its super absorbent qualities, and with a 54” wide printable area, they are perfectly sized to fit a set of four dish towels on to one yard. I began by taking photos of each recipe page, saving them to my computer and opening them in Photoshop or Photoshop Elements. The originals were old and yellowing with discoloration in some areas, but by using some of Photoshop’s edit tools — specifically the ‘auto-tone’ option (to minimize some of the blotchy discoloration) — I was able to get a cleaner appearance to each page. I then turned each recipe into a landscape orientation by going to Image > Image Rotation > 90 degrees. After editing all three images (I only had three recipes, so two of my recipe dish towels are identical), I created a 54″ x 36″ 150 DPI file in Photoshop. Select “File” > “place embedded” to bring in each of the recipe images and arrange them into a collage. Each recipe will be on a different “layer” and you will be able to edit and move them around as you please. I added a grid spacing in between each image so that I would have a convenient cutting line, and by making the grid lines a color, I had an eye-catching feature for the back, hemmed edge of the finished dish towels. To make your own solid colored grid line, just create a new background layer (“Layer” > “new layer” then drag the layer to the bottom underneath all of the others in the layers palette). Then fill the layer in with a color by selecting the layer and going to “Edit” > “Fill.” You can resize each recipe to make it fit neatly within the file by selecting your layer, then hitting CMD + T (control + T on a PC) then dragging the image to be the size you want. Keep in mind that 54” x 36” at 150 DPI (8100 pixels x 5400 pixels) will fit exactly on to one yard of the Linen Cotton Canvas and this tutorial will produce 4 tea towels. If you just want to make one tea towel, make your file the size of a fat quarter instead (27″ x 18″). Once your file is complete, save it as a JPG and upload the design to Spoonflower. Select the quantity you want and the fabric type (Linen) and add to cart! I always recommend ordering test swatches before committing to ordering the actual yardage, that way you are able to make color and size adjustments without spending a lot of money. The dish towels were simple to sew up. I cut them out along the grid lines and turned back the hem. I also sewed a small length of twill in one top corner of each dish towel for convenience. The Linen Cotton Canvas is a beautiful fabric and will only improve with extensive washing and use. The really nice thing about these is that if they ever do suffer from wear and tear I can simply have more printed, without even having to dig the original paper copies out from storage. No access to Photoshop? 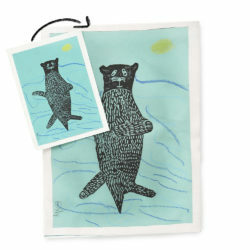 You can also create these tea towels in a free, easy to use program called PicMonkey. 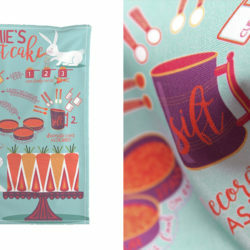 Check out our easy tutorial for how to create recipe tea towels with PicMonkey here. Hi! 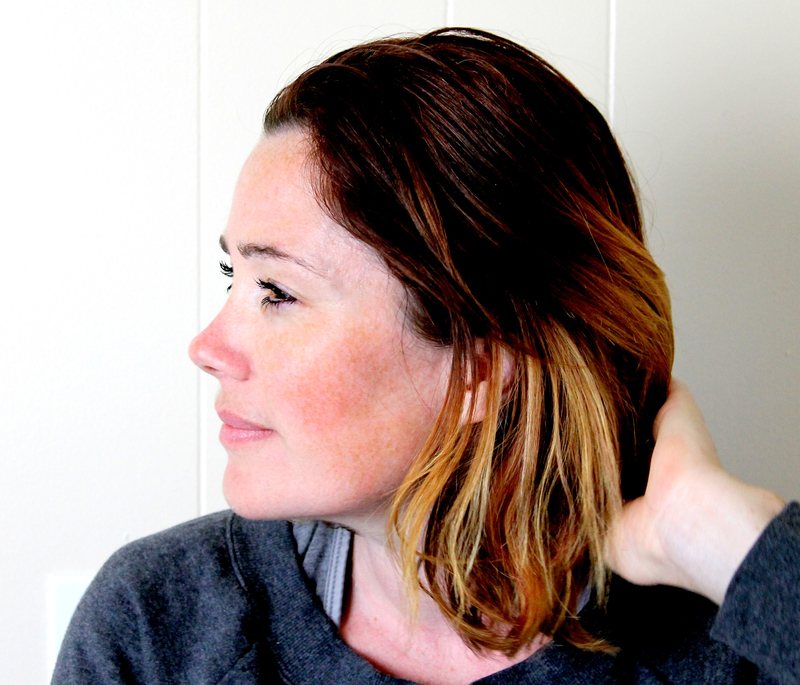 I’m Emma, and as well as working on the Fiskars Design Team, I blog over at hellobeautifulblog.blogspot.com. I’m an obsessive sewer, often leaping into projects with more enthusiasm than talent, more bravado than skill and more good luck than anything else. This technique has worked well for me so far and more often than not, I make things I love, even if they’re not absolutely perfect. And though I’m no expert, I have a passion for fabric, color and design. I know what I like and what I like makes me smile. This is the most brilliant idea. My mom is losing her eyesight and she has favorite recipes. Instead of calling me, she can have it large on a tea towel–thanks for the great idea!! That is a sweet idea. I don’t have any handwritten recipes from my family, because from an early age I was copying the recipes into my own handwritten cookbook. If I did, I would certainly be doing this! Seanna Lea it would still be a great idea of having those family recipes (whether or not they are handwritten by them) on a towel! You are lucky to have a multitude of recipes from your family! I think you should do it!! …and Patti Lee had a good idea to give them to children, or grandchildren in your handwriting — think of other family members (cousins perhaps?) that might like their aunt or great aunt’s recipe, grandma’s cake recipe, etc. I think I might do this myself for my younger siblings that are hard to buy for — I bet Grandma didn’t write down her recipe for fried biscuits for them because they were much younger than me. I hadn’t even thought about it until just now!! What a way to honor your grandmother and create a living legacy for everyday use. Thanks also for the very easy to follow instructions and willingness to share your fab idea! These are so lovely! Did you print the recipe directly onto the fabric? This is a great idea! I don’t understand how you actually did the printing after creating the collage. Can you explain? As I understand it, she uploaded the print to spoonflower and they did the actual printing. I can’t wait to try this for myself. What a great project! I just ordered mine! I absolutely cannot wait to see how it turns out! The price of your tea towels will vary depending on the fabric base and how much you order. If you were to order your tea towel design on the recommended 1 yard of Linen Cotton Canvas, the price would be $24.30/yard. If you ordered your design on a single Linen Cotton Canvas fat quarter, the price would be $12.60 More details about our pricing per yard can be found here. I used Spoonflower to do this earlier this year, as a Mother’s Day gift. It was such a hit with the entire family, I plan to make more at Christmas. So special! My Grandmother always had such a special handwriting and now that my mother is also gone, I treasure seeing her handwriting as well. I save all of her recipe cards and sewing notes. I plan to do tea towels for my sister for Christmas. What a great idea!! Brilliant Idea! I love it! I was just thinking about scanning in my grandmother’s recipes and creating a book for family members for christmas – this is so more creative! Thanks for sharing! I am so excited to hear about this. I have some simple watercolor images of my own that I’ve been wanting to get on some tea towels. Might be able to use what you’ve done. Additionally I’m very excited about the thought of doing old handwritten recipes on the towels. This sounds so exciting to me. I can’t thank you enough for sharing!!!!! Also to know that 4 tea towels fit into one yard,very handy :). Love this idea so much…but I am stuck on the step of changing your collage to 54″x36″. Its not listed as an option. Any suggestions?? Thanks! If you’re using Picasa’s collage option, click on the size options drop down menu underneath Page Format. There, you can select ‘Add custom aspect ratio’ and there you can add your own dimensions. Hope that helps! Yes, I was excited to discover that! Wow! I’m so happy my tea towels inspired you to make your own!! Thanks for letting me know! What a wonderful idea! I created my collage and saved it as a 54 X 36; however, when I upload the collage to spoonflower, the image is only about 34 X 36. So the pattern repeats to fill up the entire yard. I’ve tried recreating the collage a couple of times, but I always get the same result. Any tips? Sorry…it shows up as 34 X 20–not 34 X 36. You probably need to take control of the dpi (dots per inch) as well as the alleged inches if you aren’t going to deal in pixels outright. A quick calculation here on your dimensions (34×20 instead of 54×36) suggests that your program was trying to use a standard on-screen 96 dpi or 84 dpi (since your results are not consistent with each other). I am having the same problem as Katie. I am using Picasa, set the size at 54 x 36, and when I upload to Spoonflower, I am getting an image that is 34.13 x 22.75. I tried what SEF said, and tried to “cheat” the measurements, but it continues to create an image that is 5120 x 3143 DPI; regardless of the measurements that I put into the custom layout. Any help would be MUCH appreciated. I have 4 recipes that my late mother in law hand wrote, and I know my husband would LOVE these towels. I have also tried using Gimp to change the DPI – and when I adjust it to 8100 x 5400, it says I am creating an image that is 410 MB! Yikes! Not 5120 x 3143 DPI but 5120 x 3143 pixels! Which needs to be 8100 x 5400 pixels instead. The dpi (dots per inch, equivalent to pixels per inch) setting needs to be 150 rather than 96 if you are having to specify the file dimensions in terms of inches. Personally, I only work in pixels; so this kind of nonsense doesn’t arise. If your file size (in bytes / kB / MB) is then too large, you need to try saving the image in a different format for upload to Spoonflower. Keep your native TIFF, AI, PSP or whatever as your master copy which you always go back to whenever you need to make changes. But export a working printable copy of the file as a JPG (easiest for messy things like photos, scans and painty scribbles but loses some of the original image details) with a sufficiently high compression setting to fit into Spoonflower’s requirements. If your underlying pixel problem is that you simply don’t have enough of them, then you may need to scan your original documents at a higher resolution (dpi) in the first place. With digital photographs you are limited by the megapixels of the original camera. You can scale things up but that results in a certain amount of visible pixellation. It all depends on where you are getting your images in the first place. This may be your problem. I don’t use it myself so I Googled for information on it. According to one person, its collage feature is limited to 5120 pixels maximum – a suspicious numerical match! So you wouldn’t have any chance at all of creating the file you need with that tool. You’d need a better program. Or perhaps any such limit depends upon your account type (= money! ), since the original blogger claims to be using Picasa. Thanks for the clarification of DPI v pixels. Sorry! As I have looked around, it doesn’t seem that Picasa can handle creating an image that is larger than 5120 pixels on either size (which seems to be the case, as no mater how I adjust inches, 5120 is as large in pixels that it says that I have been able to make it). That leads me to wonder how anyone has been able to create an image 8100 x 5400 from Picasa (I am hoping someone can shed some light on this) to upload it directly to Spoonflower. Several seem to have been successful. Am I missing a step in Picasa? I scanned my originals with 600dpi resolution, so I don’t think that is the problem. Ohhh… with the image size 34.13 x 22.75, the towels end up being ABOUT 17 x 11, which is about right for a tea towel – I think my problem was I misunderstood that the image would take up the entire printable size (54 x 36) – which would actually make 4 really big towels (26 x 18). My misunderstanding all along. Very excited to get these back for some awesome family keepsakes! Thanks to the original poster!! Sorry for all my confusion! What a fantastic idea! Thanks so much for sharing. Have you figured this out yet? I’m still not having any luck. Never mind…just read this. Thanks! Now I get it. 😀 Ordered mine yesterday! Can’t wait. I actually ended up trying the “half-brick” repeating pattern, rather than centered, which gave me 9 towels on 1 yard, instead of 4 – it makes use of the “extra” space that I was coming up with a 34.13 x 22.75 inch image. Excited to see how this turns out. That is so fantastic! I have a few/some handwritten things from my Grandma and I think this is a great way to save them. I also like the idea of being able to put them away and just reprint with a photo. Thanks for sharing! So glad I read all of the comments, because I was starting to go crazy too, getting 4 to fit right on the yard. So it looks like you can actually print repeating so that nine whole photos will print on your yard rather than the four? Does anyone have any input on grid border size? I did mine just guessing, but it’s sort of hard to tell looking at the screen. I just ordered two swatches (trying to decide what grid color to use, and want to make sure the photos are going to look ok) and can’t wait to see them. Has anyone received theirs back and have any new input? Can’t wait to try this out and share it with my family! My Mom’s been ill for quite a while and used to be a great cook, so her recipes are well loved by many. Several years ago I created a book out of many of her recipes, but this will be another way to cherish her hand-written recipes and remember her when she’s gone. I have a Mac. I saved the Picasa collage on my desktop and opened it in Preview From there I changed the size to 54 x 36 inches and 150 dpi. When I upload it to Spoonflower and 1 yard – it appears to fill in the whole yard. Is this correct and should I feel ok about ordering? I would be interested in knowing if they turned out for you. The gal that originally did this definitely only had 4 towels for each yard (which would be a nice size towel to dry dishes with, etc). I’ve also had problems getting the individual recipes to fit within the borders, since they are different size papers (my grandmother wrote out the recipe on whatever she had on hand). I’m getting so frustrated with this, but really want to figure it all out. Any help? Hmmmm…I did this, too, but it’s still not the full yard. Still can’t figure out what I am doing wrong, plus some of the recipes are not fitting within the borders, as the papers the recipes were written on are all different sizes. Getting frustrated–how did yours turn out (if you ordered them)? I also can’t find the preview on Spoonflower to see what they look like before I order them. Sigh. I usually can figure this out, so I’m not sure what my difficulty is with this project. Hope your material worked for you. Any suggestions? I didn't do recipes – I created subway art so they are all about the right proportion. After 'stretching' and positioning them on Picasa, four towels seemed to fit. I did order them – haven't come yet – probably will be at least another week. I will let you know. The only preview I am aware of on Spoonflower is where (after you upload your jpeg), you select the fabric and yardage before you place the order. A "ruler" is on the screen and it shows how your material will look. Does that make any sense? My only suggestion would be to put your four recipes in a collage on Picasa and enlarge or stretch each one to fit 1/4 of the collage so that you have four towels of the same size that fill the screen. If you have various size recipes (index card size vs. notebook paper size) then when you size them the smaller ones will have to be enlarged more and therefore the writing will be bigger. Just enlarge it until your writing hits the edge. Part of that towel may be blank but that is probably ok. If it is an index card, what if you put it vertically instead of horizontally? I hope this helps – I feel like I am rambling senselessly. That makes total sense! It just seemed so easy from the directions, but I think that there are some missing thoughts. Thanks for your help! Julie, I haven’t ordered them yet. I’m using Picasa and having problems similar to everyone else, where I set the size in Picasa but it doesn’t fill in the whole yard of the fabric (interestingly I have noticed that it does fill some yard, but not the fabric the OP used and that I’ve been trying to use). I just ordered their fabric sampler so that I can see if there’s a different fabric I want to try. I’m also going to try rescanning the recipes in a higher resolution and see if that helps. As far as recipe sizes, I’m having similar problems. One of them had the whole side cut off because of its size, so I’ve been just adjusting the height and/or width until they are a similar size. Good luck! My daughter was able to work with the recipe and get 95% of it on there. Her thought was that you aren’t going to make the recipe from the towel–it’s just a reminder of that person and their handwriting. However, it’s still not even close to filling a yard of material, so we’re still working. Sigh. It seemed so easy, too! I feel like there are steps that are missing. Back to the grind! I did 9 and I think they turned out perfectly! They are a little smaller than a traditional dish towel but not much. I would take a picture but my friend is hemming them for me since my sewing machine isn't working. I plan to order another set if 9 for Christmas presents!! Changing it to 9 brick pattern didn't change the size of the towels for me, since I couldn't figure out how to make them any larger, it just made it so I didn't end up with so much wasted material around the edges. I love them!!!! Julie, I think I might have figured out the yard/size issue, though I haven’t submitted it to order yet. Picasa definitely seems to have a size restriction, so I created the collage as the OP indicated, and saved it to a location on my computer. Then I used a different program (Snagit Editor, in my case), and resized the image to be 8100×5400 pixels. I saved that to a location on my computer, and just uploaded that to Spoonflower, and it fits perfectly in the yard! I am still trying to find more recipes that my mother handwrote before I’m ready to finalize it and submit the order, but I think at least I’ve overcome that size obstacle! I did have to modify the “canvas size” of some of the images – I made the images longer so that the sides of the handwritten recipes weren’t cut off. Good luck with yours! Booyah!! Perfect and done! I just placed my order for a yard of the fabric with four recipes, so that I can see how they turn out before I add some more for gifts. I’m excited! Holy cow, that was complicated! Thank you so much for your input. I hope your towels turn out well. I’m planning on having some for my mother’s 79th birthday in October, and a few for my brothers. If they turn out half as good as I’m hoping, I’ll be the hero amongst my brothers for at least a day. Have a fantastic week and thanks again! so is that what worked for you too, using another program to change the image size? I’d love to hear how yours come out! Yes,that’s exactly what worked. I had already saved them to my desktop, and I opened them in Preview (I have a Mac) and then easily resized them, then downloaded them to Spoonflower. It was all in knowing what to resize them to. It said 7 days, so I figure a couple of weeks. I’ll let you know how they turn out. One of the recipes has to be at least 70 years old–I’m pretty sure that either my great grandmother or my great-great (!) grandmother wrote it out on a piece of paper that was from a cotton mill in my grandmother’s home town–southern fruitcake, so I’m really looking forward to see how that one turns out for my momma. I love this idea! That’s fantastic, and what a wonderful memory to have! I’m doing recipes that my mom hand wrote on recipe cards – she was a wonderful cook and is currently in a nursing home with dementia. She’s been ill for about 10 years, and I’m missing her handwriting so much that I think this is going to be perfect! I hope yours come out great! Sounds like you had success! I just got my yard today. Looks good except the grid lines appear to be a problem – when you cut the towels, the inside borders will end up being half the size of the outside border and not wide enough to look good on the reverse side. The picture in the original post showed a border that looks even narrower than mine so I don’t understand how they all look the same on the reverse side. Guess I should have made the grids twice as big and trimmed the outside edges to equal the inside edges after they are cut. Any thoughts? Yeah. I woke up in the middle of the night after I submitted my order, realizing this (I’m a bit embarrassed that I didn’t think of it before, because I’m a quilter and seamstress). I have (I hope) about an inch border, which will be ok, but on the next ones, I’m going to make them be about 1-1/2″ or 2″. I’m waiting until I get my order to see how they look. However, you could always sew some bias tape that coordinates with the color and turn that back. I figure that it won’t be a huge thing–after all, it is the front that will be seen, and a regular towel only has about a 1/4″ hem around it. Either way, I’ll just hem them and figure it out for the next group (which will actually be gifts). Hope you can get yours to look to suit you! That’s funny – I realized the problem about 2 hours after I submitted my order. I should have called to cancel. I am by no means a seamstress but I should have had enough common sense to figure it out. My border only ended up being about 1/2 inch. I was hoping for an inch. Good idea about the bias tape. I’d love to order something like this for my mother and her brothers – my grandmother passed away in June. 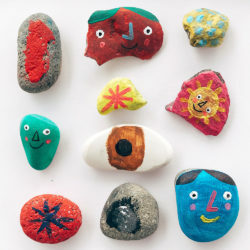 I am so NOT creative or crafty, but I’d love to find a way to order these for Christmas gifts. I can take pictures of my grandmother’s recipes and send them anywhere needed. Can you point me in the right direction? Thank you so much!! Hi, Emma! I have been trying to get this project off the ground for a week or so…in addition to sizing trouble (Picasa won’t save my collage in an enlarged size) it seems that Spoonflower no longer sells their linen-cotton. Which fabric would you recommend second? What a great idea! Thanks for sharing this. I’ve been wanting to get some old clothing or a blanket of my Mom’s to have made into stuffed bears for myself and my sister, but we just don’t have anything like that. 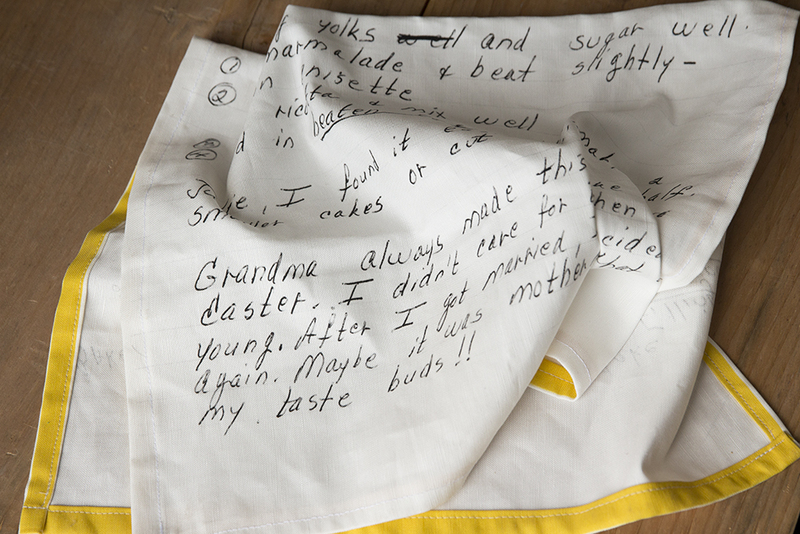 We do have lots of Mom’s recipes that she wrote out over the years! She is still with us, but this is an excellent gift for my sister and all my Mom’s granddaughters. Can’t wait to get this done – what a great Christmas gift this will be. I am having sizing issues too, trying to get the image I want (of 4 recipes) onto 1 yard has been a challenge to say the least! How did yours turn out with the sizing issues? Did anyone find a way to fit them? Are the 9 towels more like wash cloth size? I have been at this for hours changing pixels, dpi, stretching, etc. and really want to give these to my mom but can’t get the image to fit a yard. Any help would be appreciated! True story–my daughter figured it out for me (so I’m not sure). I’m usually pretty good at this stuff, but this one had me stumped. I had scanned the recipes, and then sent them to her, and she put the borders on. I have to say that I was very disappointed in the material/towels. By the time they got blown up to size, the font was so big that it’s very, very blurry–unusable, actually. I’m trying to decide if I want to put 4 recipes on a towel to decrease the size of the recipe printed or just forget it. I was really, really bummed. I can’t get mine to show just 4 images as a tea towel, I followed the directions exactly but in spoonflower it shows more than 4 towels. Help! oh boy, I was really hoping to do this for my sisters but I am lost lost lost. I have tried this in both Picassa and Photoshop. For one thing, I have recipes written on a recipe card so it doesn’t work to turn them to landscape mode. Then it cuts off half of the recipe, so I just leave it so the recipe will show sideways on the towel when its finished. I have tried resizing again and again and it still doesn’t look like it fits in the area on Spoonflower. On the “create” area you’re supposed to pick “yards” correct? When I do that it shows my 4 recipes as 32″ x 42″, so then it has big borders on the top and the bottom like this. I’m about ready to give up! Any help would be much appreciated. I have struggled with this as well! Im not sure how I fixed it but I believe it was after the re-sizing and then (this is the key!) I selected the cotton-linen canvas fabric and then selected yard and it fit perfect! Ok girls, I think I figured this out. So … click on your picture you want to upload… right click it….. go down to “resize pic” then , go to custom….. put in 8100 x 5400. it will save as a new file and name custom… upload that file to make your tea towels…. have worked for HOURS on this project. Hope it works for you. how do you PUT a border?? In Picasa, go to Collages (on the left hand side) then second button in Collages, “create a collage”. After that opens there will be a bar to set the grid size. This project has kept me up nights.. I have tried EVERY method that has been written and yet I still can not make this work. When I tried using Mac’s Preview and changing the size, It gave me a file that was 150 MB.. .which FAR exceeds the allowed upload! How do I get a file to be the correct size and dpi and yet be under 40MB????? Please help, I am near tears!!! You could also print this onto that photo paper that you can iron onto things, if you wanted it to be more decorative. i am stuck as many (above are) I have set 54 X36 in the picasa collage; but when I uploaded it to spoonflower the picture is in the middle and lots of white sorround it. I have also notice this on the right side “34.13in x 22.75in, 150 pixels/inch, Center” sooo.. make sme think that the 54 X 36 were not inches. any help?? i want to have it readu for christmas :S Thanks everyone! what progarm do you use to open the pic??? I entered 8101 X 5400 and it fits poerfectly on the yardage screen!! I hope this is useful for you too! I was wondering how the edges hold up? It looks like the original person simply cut her material and turned it over and hemmed. Do the edges ravel up to where the sewing is? I am super excited to do this as Christmas presents this year. 🙂 Been raiding my family and boyfriend’s family’s recipe boxes! I followed the (wonderful! )instructions and ordered my swatch from Spoonflower. I was very happy with how it turned out–not perfectly clear as if it had been printed, but I’m doing this for the heirloom factor, not so the recipes can be used for cooking. I was just about to order the full yard when I saw the addendum about changing the DPI and I’m very confused. I attempted to resize in Paint and just got a blurrier image. Spoonflower currently says my DPI are 150 and the project is 34.13in x 22.75in centered. If I do nothing, will Spoonflower just print it as slightly smaller than one full yard? I can live with that. I’m just a little leery of changing a bunch of things as I don’t have time to order another swatch before the gift needs to made. This is the greatest idea ever! I made some, and blogged about it here. This post might help some people getting the dimesions and pixels correct, as I show the reader how to do it in Adobe CS5. I think it worked out better than Picasa. Just now saw the rest of the comments and realized my question had already been answered. Going to try and make a 9 recipe collage in Picasa, and if that doesn’t work I’ll just use the half brick layout and have some duplicates. I just got my fabric in! They look great!! And quality is way better than I expected after blowing up my picture but the towels are HUGE! Way bigger than what I would think of a tea towel. 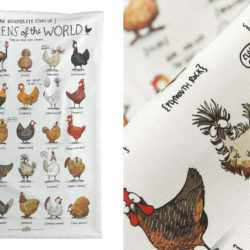 Or maybe when I think tea towel I am hoping for dish towel… I am definitely happy with them but wish I had gone smaller! You gave me the brilliant ideas about using the old recipes to turn into tea towels, I will definitely make it and show it to my grandmother as she has got the brilliant hand writing in our family, she would be happy to see this. Thanks for sharing here. Now, that is something interesting, isn’t it? It is been really different what we have all done specifically. Art can be done on and by anything. Just have to utilize your creativity and right way to implement it. I found this on Pinterest and can’t thank you enough for the unique idea and great directions! My mother passed away this summer and at her memorial friends were asking us about a particular special recipe she always made. What a beautiful way for us to share not only her recipe but her handwriting in something that is useful too. Amazing idea! I’ve already created gifts for Mom’s friends, just in time for Christmas. Thank you! What a cool idea! 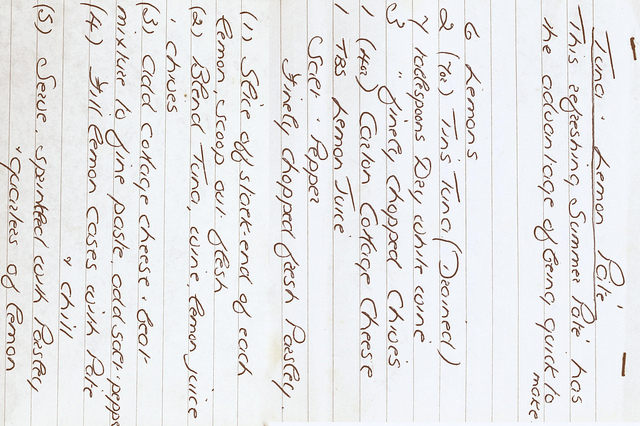 Somewhere in my house is my late grandmother’s handwritten recipe for bread pudding. I love seeing her handwriting when I come across an old note I’ve saved, but those things are packed away somewhere. I would like to have them out and useful. I am going to take photos of my Grandmother’s goodies and try and see if I can get the image perfect as well and oder some for my brothers homes. I was going to do her whole handwritten cookbook for each but I LOVE THIS!!!! Could you give me an idea of how much this costs? Before I go through with the project, I need an estimate to see if I can swing it. It’s a wonderful idea and I would have to find a MAC somewhere and someone who understands the instructions…but I have a copy of my grandmother’s applesauce cake recipe we finally found on the front page of the cake section of one of her cookbooks…it would make an awesome gift for me and my sisters. A single tea-towel design on a lone fat quarter of the linen-canvas would cost $14 dollars + postage/shipping (which varies according to where you are in the world). A set of 4 tea-towels would fit on a yard of fabric and the cost of that on linen-canvas is $27 + postage/shipping. PS for your own stuff, there’s a 10% designer discount – which should partially cover the postage cost. I finally got around to this project today. Creating the tea towels for my MIL. 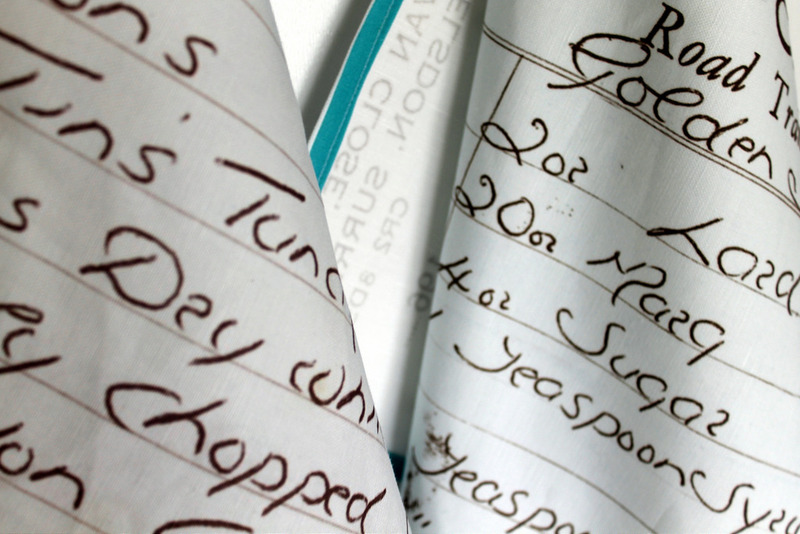 As the handwritten recipes I have are all various sizes I chose to type them out on recipe cards that I created. I did a recipe from each of her DIL, 1 from her mother and 1 from her MIL. I too, initially had the problem with my collage showing up in the middle of the example but went followed the instructions above to adjust the size. When I uploaded the picture the second time, it appeared to work correctly. Looking forward to seeing the final yard of fabric to make sure everything turned out well (I’m a bit worried about the it being blurry – it looked great on the picasa screen but who knows!). i made mine and got them back and like another said the towels are huge but the quality is amazing. I did them for my dad and it is either his moms or grandmothers handwriting he wasn’t sure. This is such a sweet gift idea especially for a grandmother or mom. I highlighted this DIY on my Best of Pinterest post. How, exactly, is this “DIY”???? hello! Beautiful DIY this but maybe I missed a detail! 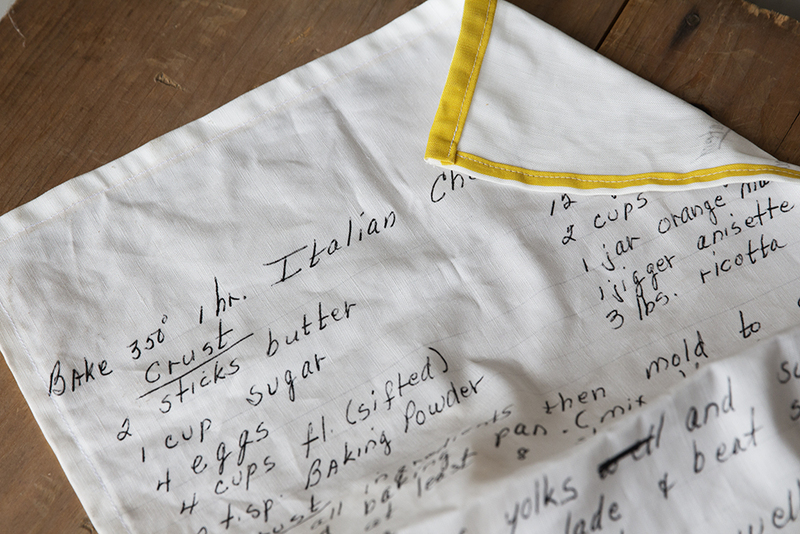 I do not understand how you managed to transfer the written recipe on fabric? Would you be kind enough to me again? thanks and congratulations! Spoonflower (who owns the blog where you are posting) is a custom fabric printing company. They take ordinary image files which anyone, not just big corporations, can upload to their website and then they print those images onto various fabrics. They use great big industrial printers which are roughly similar to ordinary home inkjet printers in their operation. Unlike screen printing, where there’s a massive setup cost, an individual person can order just a small quantity of fabric (eg the fat quarter size necessary to make a tea towel) for a relatively competitive price. The downside is that the printed surface is shallower than the depth you get from screen printing or the total immersion of fabrics in dyes. Thank you for sharing this idea with us.I was wondering what I was going to do for my Momma. Now I know! What a special gift that will honor my grandma and I’m going to do this f or my daughter with my Momma s’ recipes. We cannot wait to make this I have some recipes of my Grandmothers. My daughter and I are very excited. Great idea. I realize this is an older message but, what did you all come up with? I really didn’t understand all of the DPI or Pixels. Can I get a good camera, upload it tonSpoonflower & get 4-6 towels? I wish the told more on how to do this! I’m a step by step kinda girl. This is an awesome idea and since my husbands family is growing by too many “2 feet”‘s for me to afford enough gifts I like to find these kinds of projects, now everyone can have grandmother’s recipe for her enchilada’s and pound cake! Thanks for sharing!!! I just received my order, I cannot wait to finish the towels for my mom for Christmas! What a great idea! I have recipes from her mother and two sisters, and a hand drawn bird that my great grandmother was known for. I can’t wait to see her reaction when she opens them! Thanks! Okay, when I put my pictures into a collage in Picasa they are getting cropped off. Any ideas? We had to share it with our readers! I love this idea and want to make these for my mom for Christmas. I’m a little hung up in the Picasa thing, though — how specifically do I get the colored grid lines on it? I read through the comments, great idea, but it sounds terribly complicated. My mom’s 5th year of passing is in Dec and ai would love to get my sister one of these! I am by no means a seamstress though. I am not a technology genious either. Did anyone figure an easier way for this? So, how big was each towel? I love this idea and can’t wait to try it! I had the same problem, which I solved using Photoshop. I created a blank canvas in photoshop with the proper dimensions and dpi, then “placed” the Picasa collage I had made onto that canvas. I then saved the document as a PNG file, which I could upload into Spoonflower. Can’t wait to get off the computer and start stitching! How do you get it printed onto the fabric? Spoonflower.com is a web company that prints custom fabric. They do the printing after you upload the design to their website. Hello! Thank you for this idea, it’s such a wonderful keepsake! I am attempting to create my collage. I added the border and it appears when I look at the clip however when I add it to the collage, it’s only displaying the border on two sides, not all four. What am I doing wrong? Hi…I see nobody’s been here since last July, so my fingers are double crossed someone pops in anyhow. How did you get one recipie on a full tea towel. I’ve followed your directions, but I keep getting multiples and I truely only want the one collage on the page. Please help. Hello! How long did it take for you to get your print back ? I am way late to this discussion. I was wondering if these issues have been resolved. I am stuck in Picassa where I am supposed to choose Page Format. I can’t even find that anywhere. I have been working on this project for quite some time. I wanted it in time for a Christmas gift. Any help would be greatly appreciated! Super idea for Birthdays too. Thanks for sharing the ideas. I will certainly be following you in the future. I was having the same problem. Try this: Open the file in Paint (the super simple program inn accessories) then You click on resize at the top. when the resize window opens click on pixels at the top of it and type in the 8100 x 5400. Then resave and open in spoonflower. This worked for me. Hope it was helpful. I REALLY want to make these for my mother. I have the recipe cards and I made the collage without any problem. But I can’t for the life of me get the collage image to be the correct size. Can anyone help me resize my image in paint or picmonkey? I just created some dishtowels of my own! I ended up using paint.net’s program instead of Picasa. I can’t wait to see how they turn out. They will be gifts for my mom, uncle, and myself, with my grandmother’s handwritten recipes. how did you get your final image to look so crisp and white despite all of the stains on the original? did you use something other than the retouch for specific areas? your entire background looks more clean than the original. i’m working on mine, and i can’t get the background to crisp up. I am confused I think I missed something? Does the company send the towels to you with the picture of your choice or do you need a special printer? I clicked on the link above to use the paint program you mentioned. But instead I ended up downloading ad ware. I still can’t get it off my computer. User beware! hi, I don’t have any of my grandma’s recipes but my mum had a book with all sweet recipes which is currently in my possession. i have another 4 siblings and I remember that each of them had thier favourite cake or biscuits from this book. 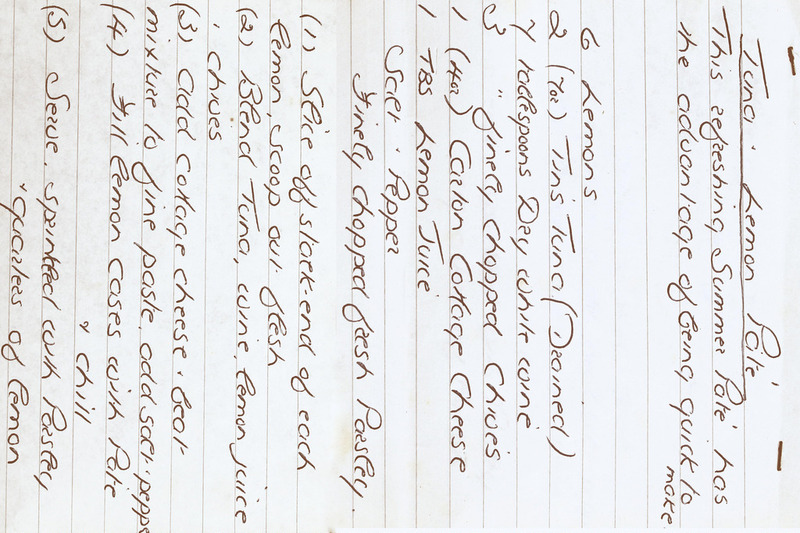 i will make set of their 4 favourite recipes as i remember i never had any favourite, i loved them all????. i am the youngest 35 years old so this will be nice xmas present to honour our mum. we are all very closed but we will in 3 different continents so this will create another wonderful link among us all.thank you very much for sharing this idea. Looks like this is 1.5 years old, but I’m going to try it. My daughter is moving to her first home and I think this would be a great gift for her. 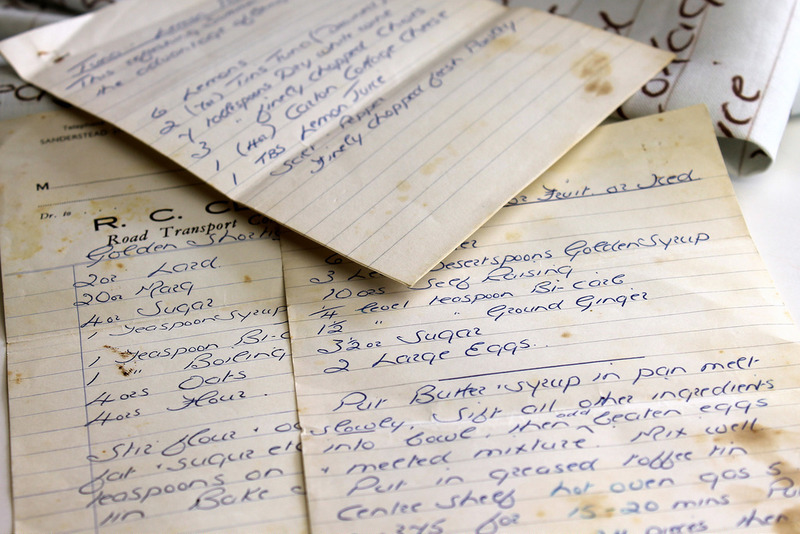 I have 4 generations of recipes – my grandmother’s, my mom’s, mine and some my daughter wrote when she was in high school. Hope I can get the sizing issues to work! Oh I love this idea! Great gifts and I will be trying it. Thanks. I am yet to try this out….but I am not going to do it for tea towels. When my sister first found out that she was pregnant, she wrote me a handwritten letter to tell me. My God-daughter’s christening is coming up in a few weeks (in Ireland) and I am hoping to get my gift made on time (in Australia). I am planning on uploading the paragraph where she told me the great news and then typing the date under it on the same fabric, and then framing the sheet on a piece of wood, in a box frame. I am on a pretty low budget, and don’t want this picture to take over the entire baby’s room! Is there a way that I can just do a small version of my print? I don’t mind paying for a whole yard but I probably only want my design to use up a out a foot. Do I just keep the writing small and then let it repeat and cut it to the size I want?? I’m not very technical (as you can probably tell)! BUT…I’m having trouble figuring out how to get it “exported” from Picasa. Where is the preview? Which program am I previewing in? I managed to figure out the rest of your directions but am stuck on this part. Also..how did you know how fat to make the grid lines while creating your collage? Thanks. I anticipate your prompt response. Again thank you thank you. what a great idea!! I am going to try it. Made these for my mother-in-law and her sister in Hungary. They loved them so much they were moved to tears! Emma, I’ve tried your project for turning handwritten recipes to tea towels. I tired using Picasa’s retouch tool but still have some blotches which I can live with. Then, since I use Windows’s, I tried opening the recipes in Paint. (Is that different than Paint.net? I created a collage but the 4 recipes would not line up straight. I still can’t figure out how to change the dpi and the largest pixel size I could get was 6100 pixels by 5400 pixels. Can you help me please? This is a great tutorial but I am such a novice at this I’m wondering if it is possible to have these tea towels made if I sent the recipe to you? I have a handwritten recipe of my mother’s that I’d love to put on tea towels for my sisters and I (also my daughter and nieces). Is there a way to insert a photo of the finished product (cake, pie, etc. )at the top or on the side? I know this comment is a little delayed, but I’m so excited and working on this for Mother’s Day. Is there an advantage to taking pictures of the recipes over just scanning them and uploading that image? Question: A sample swatch is only 8 X 8 …is it worth it? Do you really get an idea of the final product? Solution: I could not get the correct DPI using a PC so I borrowed a Mac and followed the instructions above using the Preview in Mac and changing DPI/size there. So, is it Spoonflower that provides the fabric? AMAZING IDEA!!! THANK YOU FOR SHARING! Are you putting all of your “grid” as a back hem on one towel? Or are you trying to cut halfway in the middle of the grid as you cut the towels apart? Suggestions on how wide this grid needs to be because I assume you need to be able to fold under to prevent raveling…………. This seems like a lot of work & then it may not turn out. Can anyone tell me if they have actually gotten this to work? Is there an easier process as I would like to do this. I am so frustrated. Changed the size to correct pixels/dpi but now the file size is 52mb and spoonflower accepts max 40mb. Grr!!! no idea how to fix this. Hi, is there a way to do this from Photoshop? Lisa, I found this blog’s instructions helpful for using Photoshop…http://sewing-chick.blogspot.com/2012/11/family-heirloom-recipes-on-towel.html FYI, to make cutting easier I also added lines using PS. If I were to make these again I would make them larger as they did shrink 2″ on the short side after several washings (cotton/linen blend). Regardless, I do love them. Good luck! I have saved this tutorial for a couple months because I wasn’t able to get a recipe until recently, but I cannot seem to get it to work! Each time I upload it onto the Spoonflower website, 20 copies of it appear. I tried to change the size using paint as you suggested (I do not have a mac) but it did not give me options to re-size it the way I need. Is there any help you can offer me? I don’t know what else to try, but know my mother would love this! What a great idea! I am making these for my future daughter in law. How do I actually transfer the recipes onto the fabric? Thanks! So I am almost ready to print but my recipes are cut off. (Can’t see the title and writing at the bottom). Any suggestions? Thanks, hopefully this will solve my problem as well. Probably too late, but you use the program Preview on a Mac. You can fit four tea towels on one yard of Linen which costs $24.30 to have printed with us, or you can just buy one fat quarter (one tea towel) at a cost of just $12.60. Hello, This is a really good blog, so well done, tea towels are a great product and continue to be hugely popular in the market place, If anyone needs tea towels printing I you need to use a printer that has experience in all aspects of screen and digital printing, one of these companies is our, Class Printing. We work really hard with lots of different artists and designers, visit us at http://www.classprinting.co.uk for more information, we can also send out samples if required. Como passar para o tecido? Is there someone out that does this for others. I will pay…. there is! It’s called Roostery 🙂 https://roostery.com/e?products=orpington Just the sewing part, though! I love this! What a terrific wedding gift it would make too! Is there a way to do this in PhotoShop? Just read this now. What a wonderful idea! Is this something that is still available to do? I would have to have my husband figure the computer part out for me but I would really like to do this for my sister-in-laws with family recipes. Does Spoonflower than manufacture the towels? thanks. Amazing idea! 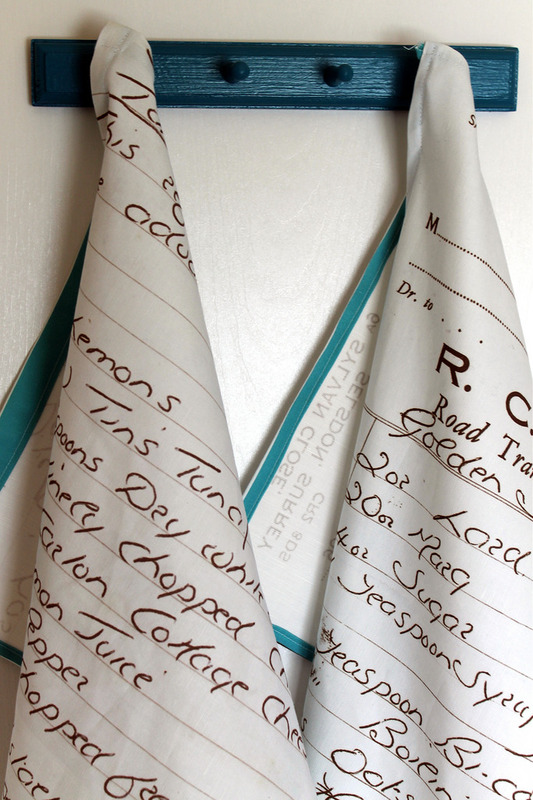 I would love to have my own health recipes as well as family recipes on my tea towels! When you took pictures of your recipes, what size and resolutions did you use? What a wonderful idea! I am attempting to make mine now, however, I cannot get the images to change to landscape. Any suggestions? What is the approximate cost of doing this project? I have two images that I am trying to double; however, when I upload the image it looks huge and I can’t see the entire recipe. I can’t figure out how to make there be 4 images on the material.. does that make sense? Make sure you hit the “smaller” button once your design is uploaded to Spoonflower, it sounds like the file was too high-res and enlarged when Spoonflower converted the file to 150 dpi. Set up your Photoshop file to be 54″ x 36,” then pull in your four recipes, each filling up a single quadrant of the yard to create four total. This worked out great!! I ended up using Staples to format my file needed to upload to Spoonflower. It was under ten bucks for the formatting. 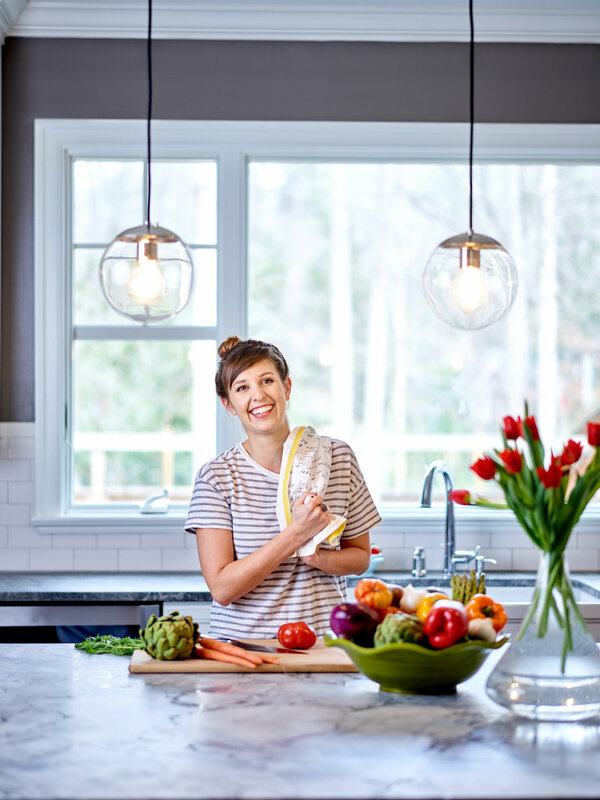 Thank you Emma for sharing such a unique way to cherish recipes. My plan is to make more. Beautiful idea. What was the cost per tea towel? Good day! I could have sworn I’ve been to your blog before but after going through some of the posts I realized it’s new to me. Regardless, I’m definitely pleased I found it and I’ll be book-marking it and checking back frequently! Thank you for posting this! I plan on stealing my mother’s recipe cards for all of our family recipes (my mother at 85 still cooks every holiday meal and dinner is at their house) for my children and my nephews wives. I might need a few towels so they get them all! So glad you enjoyed this tutorial! It’s such a wonderful way to honor the special cooks in your family! I love this and would love to have some . . . . but I have no idea, nor the ability, to do it! Does anybody know who might be willing to do this for me (and possibly others??) for a fee? I would gladly pay for your expertise. As my son says, I know just enough about a computer to get into trouble. Have a lovely day, and I hope to hear from you. I agree Kristin. My computer skills are not enough that I can follow these instructions and come out with a lovely, printed product. Love. Making mine now! How big was the blue border around each recipe for the hem? I just sent mine in and am so excited to see how my mother in law\’s recipes look! Love this! What a wonderful idea! How long does it take for you to print them? I wanted them for a wedding shower and need to know how long it will take. My mother and I each received a towel with my Great Aunt Florence’s Apple Pie recipe printed on it for Christmas. It was a wonderful surprise to both of us from my daughter. Thank you for the post – we love our towels! Such a wonderful idea, will try this very soon! Thanks for sharing!! We did try this with some images and simple text recipes from my Mums old cook book, the tea towels were really quite cool..We us Class Printing for our tea towels they can do singles as a one of or entire print runs. We did a printed tea towel christmas present with a Christmas Pudding recipe printed 25 and sent them to friends and close family. They worked really well and people still go on about them now! Love this idea! I don’t have Photoshop is there another program I can use? You’re in luck! We also show how to create a handwritten tea towel using PicMonkey and you can find the full tutorial here! Do you make these to sell? I love this so much and would love to have this done for my mom. We’re so glad you enjoyed this project! While we don’t sell finished tea towels, our sister company, Roostery, can create a finished tea towel for you! All you have to do is scan your recipe and upload it to Spoonflower! We’re so sorry for the trouble! While there are some limiting factors with PicMonkey, it’s a great tool if Photoshop is unavailable. Thanks for the reply– my fabric came and it looks fantastic! My biggest struggle with picmonkey was attempting to lay out four quadrants on a yard, it seemed like an easy tool if I wanted to a singular fat quarter. But o’ well, my determination paid off! Wow, I did it. I got a photo of my girl friends much treasured Christmas Pudding, that her late mother made every year, and now she makes it. I have zero experience with Photoshop but followed step by step. My tea towels arrived in the mail yesterday and I am thrilled. Now to get ordering for Christmas presents for my special friends. Thank you so much for your wonderful video. Thanks so much for sharing! We’d love to see photos of your finished tea towels. If you’re sharing project photos on social media, be sure to tag @spoonflower and add #spoonflower. I will share on instagram but only once I have given them as gifts. Love this idea! I make tea towels as gifts, but have only used preprinted fabric in the past. Fantastic to add my own recipe! Tip: I add a piece of ribbon about 3-1/2″ long and sew into the towel on the back as I hem. Place at a 45 degree angle at the top corner so the towel can hang. I’m curious. If you want to upload 4 different ones for the 1 single yard of fabric, how do you do that? The video was GREAT but it didn’t give additional instructions for uploading multiples for the yard of fabric. Great question! If you’d like 4 tea towels on one yard of fabric, you’ll need to place all four designs in the same file prior to uploading. A yard of linen cotton canvas is 54″x36″ so you’ll want to make sure your file is set at this size wen getting started. Best idea ever. I cannot wait to get started. I have been saving handwritten recipes for years. This is one of our favorite gift ideas and a great way to protect those precious family heirlooms. I love this project. Has anyone had success using an iPad Pro for this project? I apologize if this is included in another post. I didn’t read all of the comments. Thanks! – The video describes ordering one towel on one fat quarter. To order a yard instead, so that you get four towels, start with an artboard the size of a yard (54\” by 36\”, and set DPI to 150). You can set up your guides the same way as she does in the video, but you\’ll be placing extra guides because you will divide up the 54\” by 36\” space into four equal sections. – Several of my recipes were really way too short to fill up an entire tea towel. So I simply scanned several recipes and placed in 2 and 3 recipes per towel where needed, to fill the space appropriately. 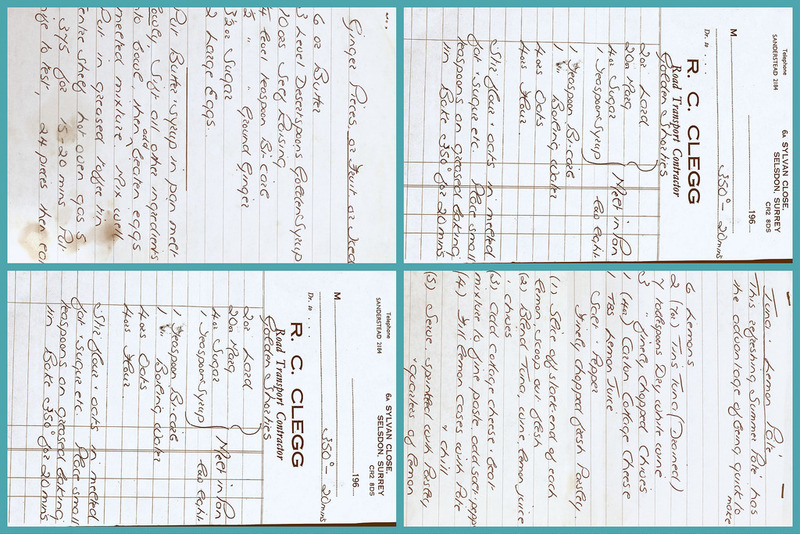 -If your recipes are old like mine, they may be stained and yellowed. I used Photoshop\’s tools to clean up my scanned recipes before placing them into my 54\” by 36\” layout. (I colored all my backgrounds white, erased some of the smudges where there were too many, and ensured the black in the writing was boosted so it wouldn\’t print too faded). – The video describes ordering one towel on one fat quarter. To order a yard instead, so that you get four towels, start with an artboard the size of a yard (54″ by 36″, and set DPI to 150). You can set up your guides the same way as she does in the video, but you’ll be placing extra guides because you will divide up the 54″ by 36″ space into four sections. – Several of my recipes were really way too short to fill up an entire tea towel. So I simply scanned several recipes and used 2 and 3 recipes per towel where needed, to fill the space appropriately. -If your recipes are old like mine, they may be stained and yellowed. I used Photoshop’s tools to clean up my scanned recipes before placing them into my 54″ by 36″ layout. (I colored all my backgrounds white, erased some of the smudges where there were too many, and ensured the black in the writing was boosted so it wouldn’t print too faded). We’ve also linked a tutorial for this project that uses the free design program PicMonkey if you prefer to not work in Photoshop. You can access the full tutorial here.